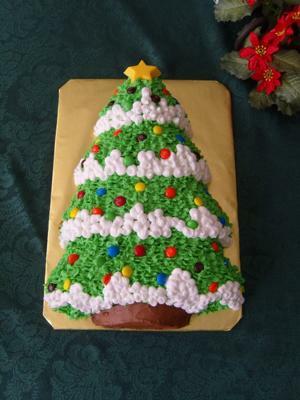 Start by baking a cake of your favorite flavor in the Christmas Tree pan from Wilton following the instructions on your cake box. Cool on a wire rack for at least 15 minutes. While cake is still in the pan, run a large knife along the edge of the pan long ways to cut the excess and make a flat bottom. Turn over onto a 1/4 sheet cake board covered with Wilton's gold foil cake paper or regular aluminum foil. Let cool completely before frosting. Prepare 3 cups buttercream frosting, put 1 cup of white aside, color a small amount with brown and color the remainder with green gel food color. I crumb coated the cake first with green, except for the bottom - frost it with the brown. Put some green frosting in a decorating bag using the leaf tip and go over the entire cake (as you would with the star tip). Now put your white frosting in another decorating bag and use the #12 ball tip to make your mounds of snow at the bottom of each tier of the tree. Then take your m&m's and place randomly around the tree to resemble lights on the tree. I molded the bright yellow star on top using a star candy mold and yellow candies that you can purchase already colored. (Both sold in cake supply stores in the candy molding section).